Crafting handmade gifts for men takes a little extra creativity — guys don't always appreciate delicate, flowery things. Fortunately, polymer clay is an incredibly flexible medium that offers a lot of options for masculine projects too. I'm a big fan of Boston Craftwork's Amazing Twist Pen, because it's so easy to put together — no pen press or pounding required. If you don't mind a little assembly work, they also sell a Mechanical Pencil that looks great paired with a matching Amazing Twist Pen. Or if your guy's a more on-the-go type, he might appreciate the Mini-Keychain Pen from Penn State Industries. Each kit costs about $3.50 plus shipping, so these are very affordable gifts. 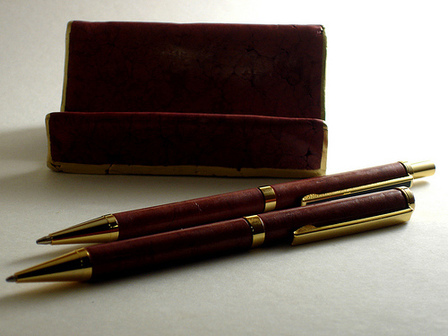 If your gift is for a business man, cover a business card case with polymer clay. 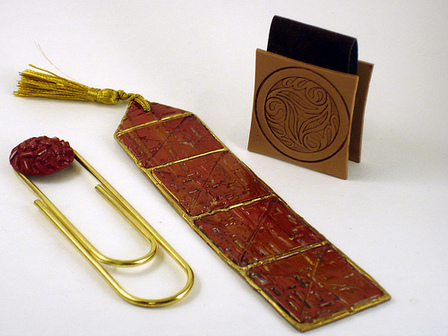 (You can find instructions for the carved business card case pictured at the top in my book, Polymer Clay 101 .) Or you could make a business card holder for his desk, using either this Card Couch tutorial or one of these ideas for inspiration. 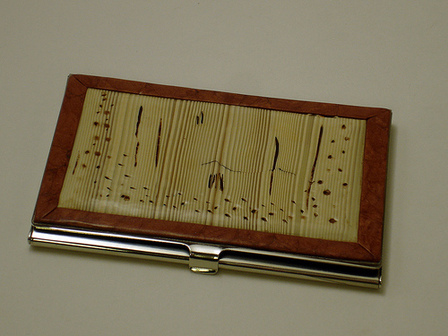 You can buy business card cases to cover for $3-5 plus shipping at Boston Craftworks. You can buy desktop card holders to cover at office supply stores. Clocks are a good functional gift for home or office. Check out Irene Semanchuk's clocks or the many clock links on Glass Attic for inspiration. There are also several good polymer clay projects in The Ultimate Clock Book . Sticking with the office decor theme, what would look better on your guy's desk than a set of personalized coasters? 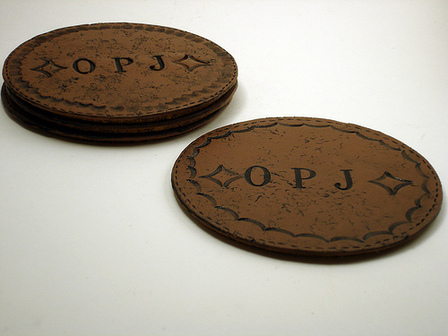 Go for the faux leather look, or use rubber stamps to create your own themed coaster set. Fill any photo frame with a picture of the family, and any husband or father will be proud to display it. That's even more true if the frame is a polymer clay masterpiece. You can cover a store-bought (or recycled) wooden or metal frame. Or you can use this method to make an all-polymer frame. Try Dean's Faux Surfaces in Polymer Clay or Blackburn's Making Polymer Clay Beads for great faux instructions. 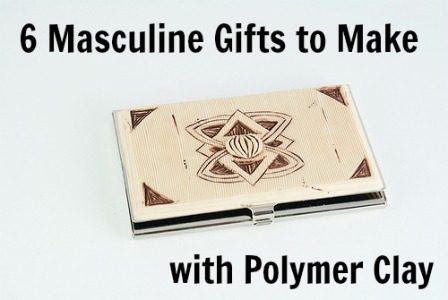 6 ideas for masculine gifts you can make from polymer clay.